Home / bcbg / best of / Club Monaco / dorothy perkins / dresses / fcuk / J.Crew / pink / "On Wednesday, we wear Pink"
"On Wednesday, we wear Pink"
When I was a teenager, I hated anything pink. I played competitive softball, and it was always a running joke that any girl who dared show up with pink batting gloves warranted the nick-name "Barbie" (used very derogatorily). I also wouldn't voluntarily put on a dress for a few years; I much preferred track pants and a sweatshirt, with sneakers. And not a nice fitted pair that makes it look like you just came from a yoga class. I mean the two sizes too large kind, that are stained and ripped, and look like they should have been thrown out years ago kind. Ew. Fast forward 5 years, and I cannot get enough of the colour, or dresses: my bedroom is pink and grey, my pink sweater shelf is the most stocked, all of my notes are highlighted in pink, you get the picture. While this 360 has been gradual, it's also profoundly important. I love every minute of how I dress now, and you couldn't pay me enough to go back. 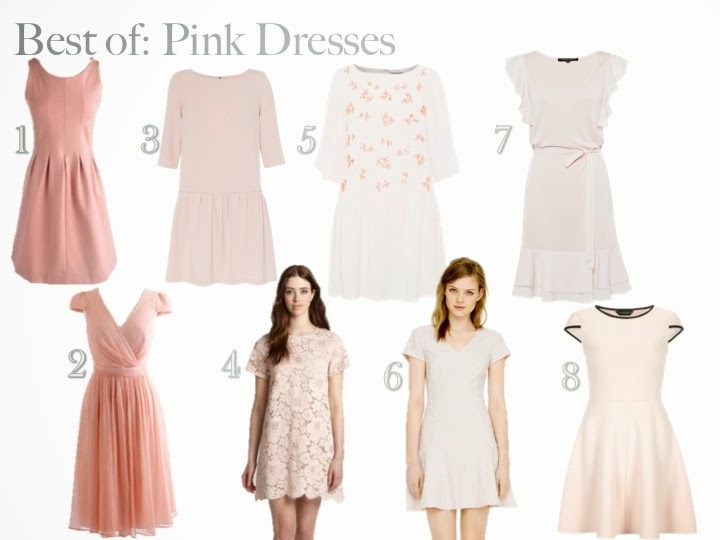 So naturally for spring, I'm planning on stocking up on a few (re: as many as I can find) pink dresses. Here are some of my favourites! What's your favourite colour to wear?